Everyone who remembers Jewish Spitalfields remembers it differently and – following our appeal in these pages – Adam Dant has collated readers’ suggestions to produce his MAP OF JEWISH SPITALFIELDS which you see below. The map was inspired by a mythical novelty placemat from Bloom’s Restaurant in Whitechapel. Adam’s print is being displayed for the first time at the London Art Fair in Islington which opens today and runs until Sunday 20th January. Spitalfields Life readers may obtain free tickets for this event by entering the code 19TAGFINEARTS at London Art Fair. 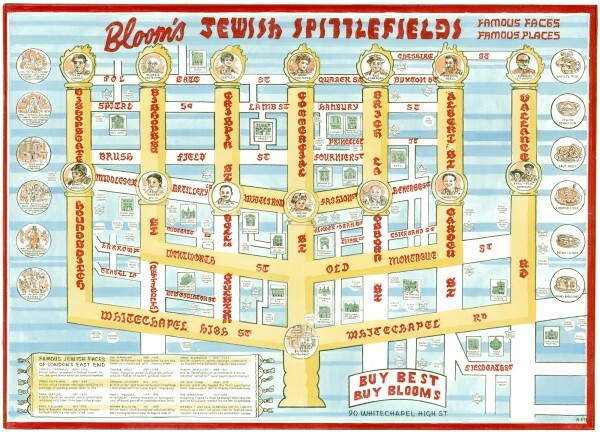 Adam Dant’s MAP OF JEWISH SPITALFIELDS was the last map completed before he was forced out of his studio in Club Row this week. 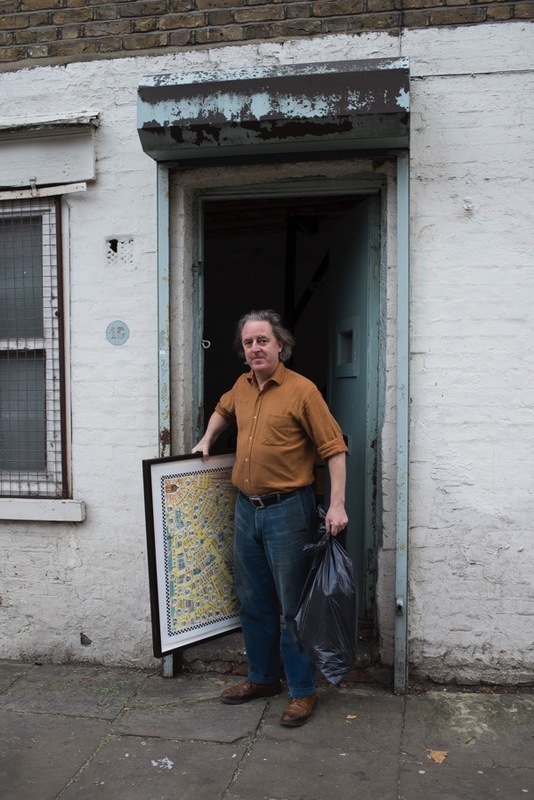 Adam worked there since 1991, when he moved to Redchurch St to be close to the printing trades based nearby. Not so long ago, Rachel Whiteread and Tim Noble & Sue Webster also had studios on the street, but Adam was the last artist to leave prior to the redevelopment of the building. Knowing this move was imminent encouraged me to publish MAPS OF LONDON & BEYOND last year, collecting for posterity the body of work he achieved in this era. 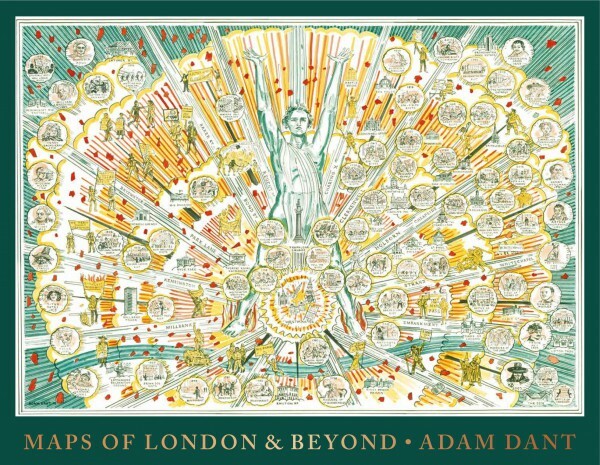 So I hope Adam takes consolation that his MAPS OF LONDON & BEYOND has been shortlisted for the Edward Stanford Photography & Illustrated Travel Book of the Year 2019 to be announced on February 28th. Fingers crossed! Adam Dant’s MAPS OF LONDON & BEYOND is a mighty monograph collecting together all your favourite works by Spitalfields Life‘s Contributing Cartographer in a beautiful big hardback book. Unparalleled in his draughtsmanship and inventiveness, Adam Dant explores the byways of London’s cultural history in his ingenious drawings, annotated with erudite commentary and offering hours of fascination for the curious. What a great pity that Adam and other artists have had to leave their studios, no doubt for more ‘high end’ development in my old neighbourhood. Growing up there in the grim, post-war peeling paint days of the early 1950′s/60′s, hardly any developers wanted to step foot there to invest. So pleased that you have been able to highlight Adam’s talents…..those maps are amazing. I hope that a replacement studio is found soon and your inspiring work will continue Adam. Oh…….and thank you for the reminder of Bloom’s delicious salt beef sandwiches! Adam Dant’s book is wonderful. Thank you for publishing it so we can have it to peruse at leisure. Everyone who loves London should own it. Very sad to read of the real London artist studios being lost. Fingers crossed for the award. Tossing roses from the US! I love Adam’s book of unique maps, and am so happy to have it in my art library. Onward and upward, sir/s! There is nothing new about artists being squeezed out. It also happens here in New York. Artists tend to discover unique places, we bring our “special sauce” to a region, and pretty soon we are out-priced and out-maneuvered. We moved into the so-called Washington Market area of Manhattan in 1978, when even basic Sanitation, Police and Fire services were sketchy — it was a hotbed of artists/designers/creatives. Fast forward, it eventually became the ultra-trendy area known as Tribeca. Thankfully, while the artists were still ensconced we took on the difficult uphill battle of Preservation, and made sure the area was landmarked. Otherwise, all of these present-day developers would be clearing away historic buildings, and using the area for their personal chess board. Long live the arts. Sorry to hear Adam Dant had to leave his studio. Just this past weekend I chatted at an art fair to a young South African leaving shortly for London, where he told me he would ‘try to find’ an affordable place in the East End of London, but doubted it would be in his price range. Developers are ripping out the heart of the area. I forgot to add that its a great shame that Adam was forced out after being there for so long ! I do hope he can find another studio quickly. Adam’s work is a signally original art form. We have both the book, and a print of the Chelsea Artists map. Forcing out artists from their studios is a blood sport over here in Brooklyn, too. I hope he can set up in a new place very soon, and keep producing his art.